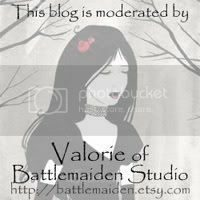 If you have a blog, be sure to add it too so folks can follow you! This should make it much easier for people to keep up with their favorite blogs. Recording of the dragon painting is on hold until I can get a DV cord for my cam corder. In the meantime, I'm making art pendants!